Chicken is so versatile, and our go-to main dish for most weeknight meals. But if we’re not constantly looking for different ways to prepare it, it can get a little boring. Luckily, we’ve got a great, easy dish that’s packed with flavor and never fails to deliver! 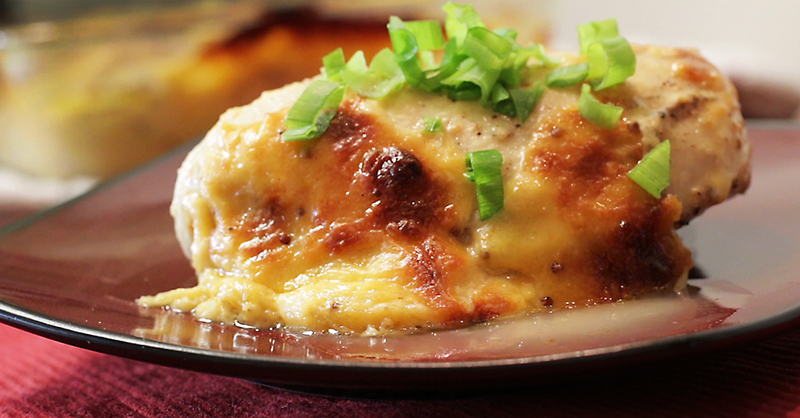 Our baked chicken is covered in a rich and creamy mustard cheese sauce. The mustard takes the sauce from good to great, and adds a deeper, slightly tangy flavor our whole family loves. It totally knocks our socks off! Check it out! Of course, feel free to tweak the recipe any way you desire – just be sure to share your discoveries with the rest of us. We’re always looking for tasty ideas and we’ll be sure to give you credit. Share away in the comments below and you may see your recipe on our page in the future! Season chicken breasts generously with salt and pepper and place in a large baking dish. Cover with aluminum foil, place in oven and bake for 20 minutes. In a large saucepan, melt butter over medium heat and whisk in flour. Cook roux for 2 minutes, stirring constantly, or until smooth, paste-like, and golden in color. Remove pan from heat and gradually whisk in whole milk until smooth. Return to heat and bring to a boil. Reduce heat to low and let sauce simmer for 5-7 minutes, or until thickened. Stir in cheeses, mustard and garlic powder, and season with salt and pepper. Remove chicken from oven and evenly pour sauce over the top. Return to oven and bake for another 25-30 minutes, or until chicken is cooked all the way through, but still tender.